Bringing home a new furry family member is a big decision and is not to be taken lightly. When planned for and chosen responsibly, a Christmas Puppy can be a wonderful gift that brings your family joy for many, many years. 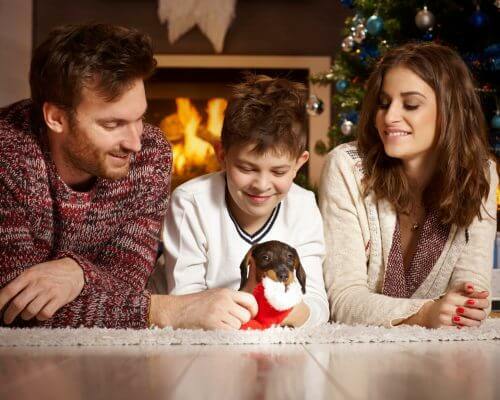 So if you’re thinking about getting a puppy for Christmas, these 5 tips can help make it easier on everyone. Crate – One that will fit the puppy as an adult with movable dividers. Baby gate – You may need more than one. Exercise pen – For longer term confinement. Collar (preferably snap release adjustable nylon for a puppy) or harness. Leash – 4 – 6 foot nylon or leather (NOT retractable). Toys – Choose a variety. Plush, rope, food stuff-able, puzzle, chewing. Kongs, nylabones and Busy Buddies are good choices. Food – Start with what the puppy was eating at the breeder. Bedding – Don’t waste money on an expensive “chew toy”. Old towels or blankets will do for now. Name tag – with your puppy’s name, address and phone number. Treats – Small, soft, meaty treats are best. Potty pads (just in case). Enzymatic cleaner – Especially designed for removing pet stains and odors. Adjustment period – Remember that your puppy will be leaving his mother and littermates for the first time to go live in a totally new environment. Don’t expect to get a lot of sleep the first few nights. It is likely that your puppy has never been alone before, so this will be a big change. Resist the temptation to bring the puppy into your bed. Instead, place the puppy’s crate next to your bed so the puppy will not feel isolated. Also, very young puppies do not have the bladder capacity to hold it for the entire night, so it’s important that you can hear your puppy vocalizing when he needs to go out. Puppy proofing – Take a good look at your home from a puppy’s eye view. What can a puppy eat, chew, pull down or climb on? Anything that you would not allow a toddler to have access to, you will need to secure from a puppy too. This includes trash, medications, cleaning supplies, electrical wires, kid’s toys, shoes, socks, and plants. Here’s where those baby gates come in handy; close off rooms and areas of the house the puppy doesn’t need access to. Time for a family meeting – What will the rules be for the new puppy? Who’s going to walk the puppy? Feed the puppy? Distribute the responsibilities so that everyone knows what their job is before the puppy comes home. It’s important to establish the house rules so that there is consistency. Without this, your new puppy will have a very difficult time understanding what is expected of him. Find a Veterinarian – Plan on taking your new puppy to a vet within the first week for a wellness exam. If you don’t have a vet picked out already, now is a good time to do some research. Ask friends or family that have pets who they trust. Read online reviews or visit the vets in your area. Since you and your vet will be partners in your puppy’s lifelong health, it’s important to find someone you trust.